I recently received a package of cigars from Miami Cigar. Inside were 6 different varieties of a Mid-Atlantic regional exclusive release for a new vitola in the Preferidos lineup. The offering will include the original Preferidos blend, draped in each of the six wrappers (Brazilian sungrown (Ruby), Cameroon (Platinum), Connecticut (Sapphire), Connecticut broadleaf (Diamond) Corojo (Gold) and Ecuadorian Sumatra (Emerald)) – but in a 5.5” x 42 Corona Especiales. They will be sold exclusively in the Mid-Atlantic region, and retail for about $7.20 per stick. The line will also be available in a 150-count crate containing 25 each of the wrapper varieties. Today’s review is for the Platinum Cameroon edition . It features a Cameroon wrapper over the existing Preferido filler blend. The sample I received displays a medium brown color with some significant mottling. Like the previously reviewed Gold, the wrapper leaf feels oily and very smooth, but little sheen is visible. Veins are pronounced, and act to obscure the seams. Overall, the pack was sound throughout. The unlit draw is near perfect for my tastes, providing modest resistance and a sweet hay flavor. There are some mildly sweet earthy notes in there as well, but not a great deal more. The aroma is straightforward tobacco and barnyard-esque. Once lit, the first few puffs from the Platinum Cameroon Preferido were captivating. The direct flavor and finish were faintly sweet and honey like, but the retrohale was a different story altogether. It was deliciously piquant and bold, delivering a short lived tingle through the nose. The interplay here was a pleasure. I’m surprised by how well the profile held up throughout this first third; often, either due to conditioning or adaptation of our palate to a cigar’s spice, this effect will become muted after a few minutes. The Platinum Cameroon held fast. Kudos to La Aurora. Going into the second third, the spicy retrohale does abate slightly, but remains ever-entertaining. The core flavor evolves a bit, becoming more leathery – but with a minor salty character now. It has developed a very “clean” finish: crisp, but non-polluting to the palate. Almost – almost – minty. By the final portion of the cigar, I find myself questioning why I haven’t spent more time with the Preferidos in their omnipresent figurado editions. The strength has picked up some by the final minutes, but I’d put it firmly into mid-medium and certainly approachable to any cigar smoker. The burn line wandered some throughout the cigar, but not problematically. I never had to relight, but did touch it up at varied intervals. In the final minutes, the leathery flavors matured, becoming nutty at times (despite a decline in the earlier sweetness). 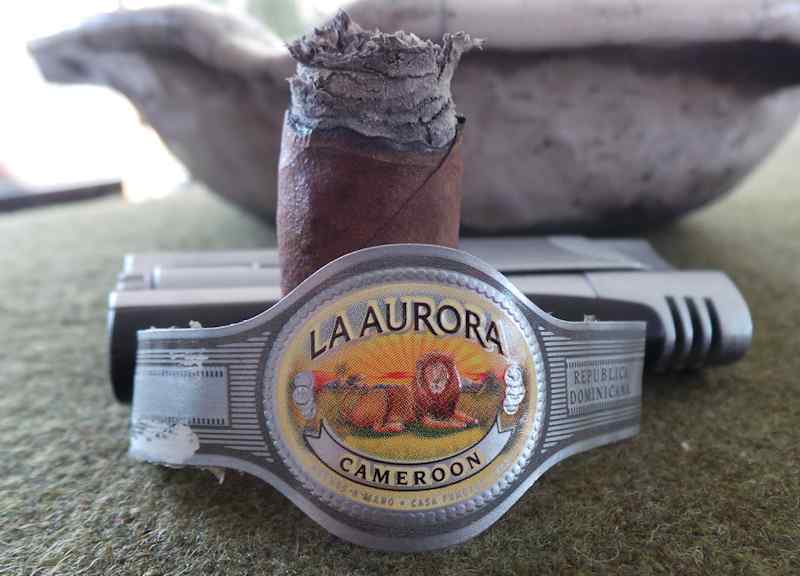 While I expected the Gold Corojo Preferido to be my “pick o’ the litter,” I have to say the Platinum Cameroon was quite enjoyable – as its impressive score indicates. The flavor was consistent in character but nuanced and entertaining. 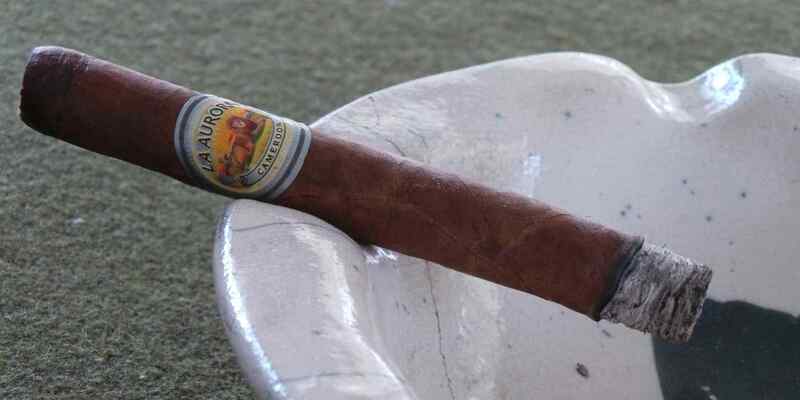 La Aurora simply does a good job in blending to this leaf. I’m picky with Cameroon, and the Preferido Platinum is a fine example of the leaf used beautifully. The blend simply works. I now have a renewed and growing appreciation for the Preferidos, and expect I’ll put some of these aside for rainy days – either in the standard figurado, or this corona especiales if available.